Firstly and most importantly, Nigel Callender made the semi finals of the comp and while ran out of steam on the burly problems, made a truly inspiring effort so serious kudos my friend! He joked he was the token Irish guy in the finals, but if he was the token Irish, what was I?!?! Anyway, what a fun event! 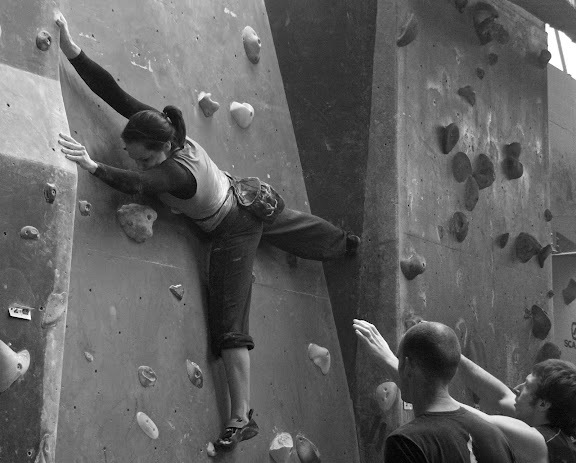 30 problems, run in the same format as the Irish Bouldering Leagues (i.e. 3 goes) but without the, depending on my mood, good or bad option of resorting to a B version and winning on strategy. Here it was all about just how good you were. The route setters were amazing, a ton of problems that basically just didn't involve pulling hard, your technique had to be up to scratch also (the photo below gives an idea) and some big names were left floundering in the aftermath. Myself, I let myself down on both. I could throw out a few excuses but at the end of the day, none matter, I just wasn't good enough - even by my own expectations. But as always, from a beat-down comes some revelations and realizations. I seem to have lost all dynamic power - I just don't 'give' 100% on moves. That'll be sorted quick - will start setting some problems at the wall. My crimping is still letting me down - that's going to take time, I can only hope to get this up to an equivalent pocket-pulling level by next winter. Something I knew about, but boy did it show at the comp. Tweaking a finger at the comp won't help this right now but lots of icing will hopefully get me back on track soon. I don't have that mindset for comps that you really need to do well (even if not excel at the comps) - I jus don't pull hard. It's that stoopid, have-a-laugh-mindset that kicks in when I'm at a comp but it's just daft. When you see how seriously (even while having a laugh) all the others, especially the foreign contingent (I'm still Irish so that means anyone outside of here) were taking it, it was a good reminder to focus! case in point, three problems I didn't even complete on the day, but not from being tired/weak/jaded - I sent the next morning as warm-ups. This full-on mindset is what is required on routes, I floundered on my project in Turkey from the exact same let-down. So in the end, I finished up with a deserved average result, but should have ended up doing better. Not much better, but better. The comp really opened my eyes though, I really need to be spending more time climbing with people stronger than me, I feel like I've stagnated and it showed. A lesson that I let myself hide behind a little bit - I got comfortable at my level and got complacent. From the overall comp point of view, it was super-inspiring to see the top-level guys and girls. Jeebus, they can pull hard all day. 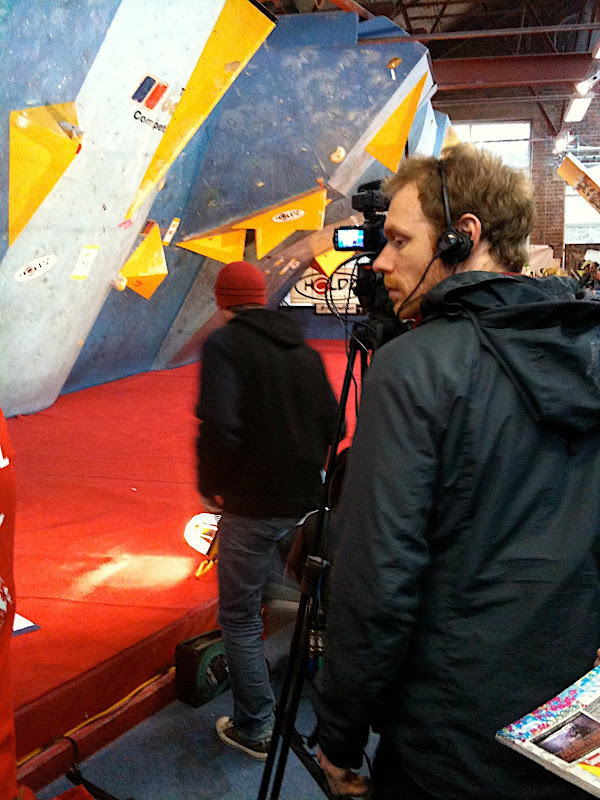 Interesting insight of the day was watching the world-cup champ, Ernst, just not get tired at all as the day went on. On the mens side, just watching some of them really fight on problems was an inspiration in itself. Watching them start the 3rd final problem with a handstand into a foot-jam and obligatory sit-up was crazy! One point of note that a lot of them were seriously burly climbers, something I will never really be so I'll have to see how I can work around that as I go on - it's probably not as much of an issue for routes. On a side note, does anyone know a good trainer for grade-8 climbing? Interested to have a chat, even if it involves cash. So, who was the dude in the photo anyway?? Kindof resembles Johnny Gilmore?? ?